This story of a lady's love for her goose will touch your heart! APRIL 21, 2006: I moved to a new community around Atlanta, GA last November; it has a large pond with several geese and ducks. In researching more about the geese that are my new friends, I found your Web site. I enjoy its stories and articles about these amazing creatures. The geese on the pond here vary in number from about 12 now in the Spring to as many as 26 back in the winter. I feed them cleaned, whole corn and occasionally a bit of whole wheat bread as a treat. When I first approach the goose I will stoop down or sit down on the ground. As I reach out with one hand with food, their beak and neck begins shaking rapidly (trembling, actually). Ignoring the food, then it will suddenly extend its neck outward and put the bottom of its beak (closed) on my forearm ---- and, in the same motion, push its head/neck up the arm to my shoulder (or even inside the shirt sleeve)! Then they pull away and go back to ordinary behavior (eating, preening, etc.). Although others feed the geese occasionally, no one I have asked has ever seen or heard about this before. This behavior seems extraordinary for wild geese that have not been raised as pets. Have you heard about this before? OUR ANSWER TO BRUCE: NO, WE HAVE NOT HEARD ABOUT GEESE GIVING HUGS AND NONE OF OUR GEESE HAVE HUGGED US (THOUGH WE'D LOVE TO BE HUGGED BY THEM, NATURALLY) BUT IT APPEARS THAT YOUR GEESE ARE SHOWING THEIR AFFECTION AND GRATITUDE TOWARD YOU THAT WAY. AFTER ALL, YOU HAVE EXTENDED YOUR FRIENDSHIP TOWARD THEM AND THEY NEED A FRIEND. JESSICA TARPLEY INFORMED US THAT SHE HAD EXPERIENCED SUCH A GOOSE HUG. APRIL 29, 2006: Four of the adult geese have given goose hugs (the three with physical challenges plus another) out of a flock of about 20 geese. I think that the goose hug must be a somewhat common behavior --- that is, not a quirk with just a goose or two. However, it is initiated entirely by the geese. I cannot hug a goose on command, but I can let (or not let) them hug me on the rare occasion when they want to. It would take a video to capture it (rather than a photo), since it is not an actual "embrace." It would be quite challenging to capture a hug, since it lasts only 2-5 seconds and I only see it 3 or 4 times per week. But I will be happy to share ideas on how to get a flock of wild geese comfortable enough with someone so that, if the geese are inclined to hug at all, they will hug them occasionally. 1) Sidekick - she is our official mascot of the lake (missing 1/3 of a wing). Our local legend and sweetheart. 2) Hop-along - has missing foot, but big heart. He gives the biggest goose hugs and is very loyal. 3) Skip-along - has limp leg, but she is getting better. Very docile and sweet. 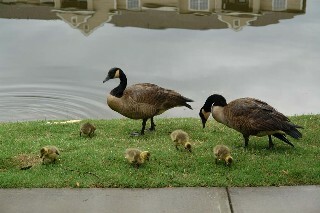 5) The new family with 5 goslings (not yet named) and their progression this summer. PLEASE VISIT BRUCE'S WEBSITE WITH PHOTOS AND STORIES ABOUT HIS GEESE.